This entry was posted in Fleeting Enthusiasms on 4 Aug 2005 by Mike. Why do biologists find the aliens of science fiction laughable? Because we know a little about how bizarre and inventive evolution is, and it’s a lot more imaginative than most screenwriters. The aliens on Star Trek were duller than what you could find in your own back garden. 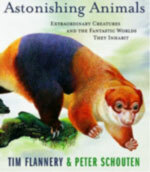 Tim Flannery, a biologist and museum director who writes regularly for the New York Review, and wildlife artist Peter Schouten collaborated on A Gap In Nature (Atlantic Monthly Press, 2001), know that truth is stranger than fiction, and aim to prove it by showcasing 90-odd amazing animals. But the brilliant twist, mentioned almost in passing by the authors, is this: one of the animals is imaginary. 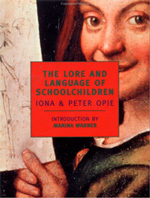 And not just imaginary in an obvious way, like the dull chimeras of Greek mythology. Imaginary in a cunning biological way, a perfectly plausible beast that happens through an oversight of evolution not to exist. So reading the book becomes simultaneously an exercise in skeptical puzzle-solving. As a zoologist myself, surely it wouldn’t be hard to spot the fake? Guess again. In the first pass through the book, everything looked perfectly plausible, or equally implausible. It was time to get serious. Flannery’s an authority on the mammals of New Guinea, so he’s in the best position to invent, say, a undescribed tree-kangaroo that only inhabits a remote and imaginary valley. How about the black dorsopsis, which, we’re told, never lays the full length of its tail on the ground (only the tip), for fear of leeches? Yeah, right. Very funny, Flannery. But oops, it really does exist. Back to the drawing board. One way to invent an animal would be to come up with a minor twist on something that already exists. Easy, but it seems like cheating. He shows four species of bizarre pipefish; would he have the gall to slip in a fifth that’s a slightly different color or shape? Nope, all the pipefish are real. Another cheat would be to invent an analogue of a real species, but transplant it to a different continent, a cheap trick evolution pulls all the time. (Dougal Dixon relies on this in his alternative-evolution book The New Dinosaurs, and that’s what made it so disappointing.) How about the sail-tailed lizard, which looks something like the marine iguana of the Galapagos, but transplanted to Indonesia? No, that one exists. Biologists have no real advantage here, because the world is too rich. Biological training is too specialized for someone to know lots about mammals, amphibians, birds, and fishes. At best it’s pick any three. And that’s leaving aside the invertebrates, which Flannery largely does. The whole book could have been restricted to ants alone, and would be no less amazing—are you listening, E. O. Wilson? In fact, a biologist would probably find it harder to pick out imaginary animals. We know too much about how weird the world is. Something that would make a lay person boggle and say “you’re kidding, right?” is all too plausible. Sometimes science is accused of reducing the sense of wonder–actually, it shows us the world is more amazing than our limited imaginations. The even-more-feverishly brilliant trick? Flannery might be lying. All these animals might be real. If it’s a lie, it’s a fiendishly clever one. After a while the parade of natural wonders in the book might make even the most wide-eyed and naive reader a little jaded. But adding a puzzle forces us to critically examine every entry, looking for telltale implausibilities. Having to pick just one is the killer. If we knew a handful of animals were imaginary, we could write off all the most implausible; but deciding we’re found the fake, then turning the page to see something even more far-fetched, and knowing one of the two must exist, is a little mind-blowing. This entry was posted in Pedantry on 2 Mar 2005 by Mike.